Three longtime icons were recently elected into the National Baseball Hall of Fame in Cooperstown. Jeff Bagwell, Tim Raines, and Ivan Rodriguez all got the nod on Jan. 17 to officially join an elite group of the greatest baseball players of all time. Bagwell received 86.2% of the vote, Raines got 86% (on his final year on the ballot), and Rodriguez squeaked by with 76%. Relief pitcher Trevor Hoffman and outfielder Vladimir Guerrero just missed out this year, earning 74% and 71.7% respectively. The Official Induction Ceremony will take place on Sunday, July 30, at 1:30pm, and can be watched live on MLB Network. Jeff Bagwell played 15 seasons in the big leagues, boasting a .297 career batting average and a whopping .408 on-base percentage. Bagwell could drive the ball all over, and even out of the ballpark. He finished with 449 home-runs, 1,529 runs-batted-in, and won a National League MVP award in 1994. He won Rookie of the Year with the Houston Astros in 1991 at the age of 23, after hitting .294 with 15 homers. Bagwell actually began his career in the minor leagues with Boston, but was shipped off to Houston for Larry Anderson, a relief pitcher who (at the time) was supposed to help the Sox make the playoffs in 1990. This trade ultimately went down in history as one of the most lopsided of all time. Tim Raines got his first chance to play in 1981. He was playing in Montreal, which was still a relatively new team in their tenth season since establishment. Raines was a hit in Montreal immediately, and came in second in the Rookie of the Year voting. He was selected to the All Star team, and finished with a .304 batting-average and 71 stolen bases. Raines made seven straight All-Star teams while in Montreal, and even stole 90 bases one year. He finished his career with a .294 batting-average, 808 stolen bases, and 2605 hits. After being on the ballot for fifteen years, Tim was finally elected to join the Hall of Fame this year. Ivan Rodriguez caught 21 seasons in the big leagues. Though Pudge was a solid hitter, (a career .296 hitter with 311 homers and 2844 hits) he will go down as arguably the greatest defensive catcher to ever play the game. Rodriguez controlled the game from behind the plate and found ways to dominate it. He retired with a .991 fielding percentage, and threw out 661 of the 1447 baserunners who tried to steal bases on him, (good for 46% of runners). He won a American League MVP in 1999, and won the 2003 NLCS MVP award as well. Pudge also walked away with 13 Gold Gloves and 7 Silver Sluggers (awarded to the best player at each position for defense and hitting, respectfully) as a catcher. 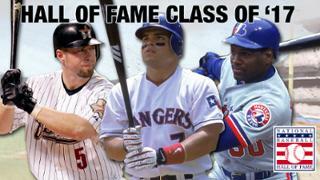 Jeff Bagwell, Tim Raines, and Ivan Rodriguez all have a special spot in every true baseball fan’s heart. They played with pride, confidence, style, and a flare for the dramatic. Above all else, they respected the game of baseball. They never did anything that mocked the integrity of the sport, unlike some of the players that also received votes for the Hall of Fame. Be sure to catch the induction ceremony on July 30 on MLB Network at 1:30 pm. Three icons will be ushered into an exclusive club, and a deserving trio indeed.